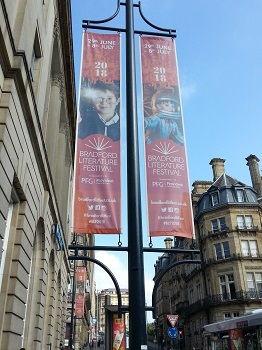 May 2015 saw the launch of the first Bradford Literature Festival - a celebration of literary culture will it is hoped will become a popular annual event for the city of Bradford and the Bronte Country area. The Bradford area is of course famous for its literary heritage, being the birthplace of the Brontes as well as John Braine and J.B. Priestley. With such associations the city makes an excellent location for literary celebration at the international level! The first year of the festival got off to an excellent start in attracting big names from the world of the arts, culture and science. 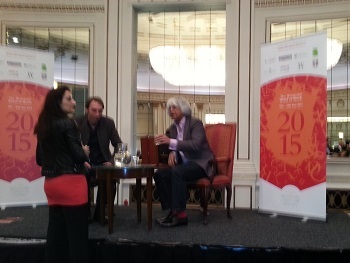 A particular highlight (pictured above) was the novelist and social critic Will Self debating philosophy and particle physics with Professor Akram Kahn, head of one of the experiments on the Large Hadron Collider at CERN, the European Laboratory for Particle Physics near Geneva. The event returned in 2016 with even more speakers and venues getting involved, and a very diverse range of topics were covered. Appropriately enough for the location there was a weekend dedicated to the Brontes with seminars given by Anne Bronte author Nick Holland, the the Bronte Society's Ann Dinsdale and TV presenter Christa Ackroyd (pictured above). 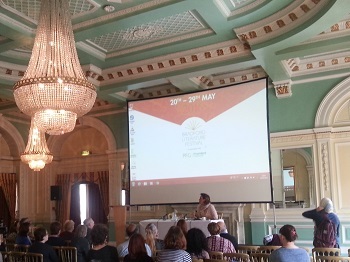 In 2018 speakers included the TV historian Dr. David Starkey, Frank Bruno, Dennis Skinner, Jeanette Winterson and Booker prize winner Ben Okri amongst many others. 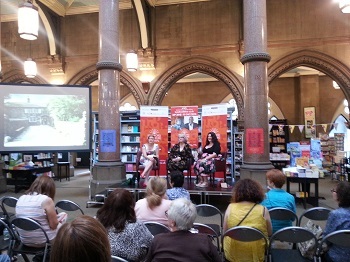 Once again there were various sessions about the Brontes, the subject of the Brontes being particularly relevant given the festival's location in the heart of the Bronte Country area!